Ahhh, the intertwining of the best of Traverse City! Breweries and the beautiful, clear, clean Northern Michigan water and air mixed together for an unforgettable experience. There is nothing better. Gather some friends or join an existing group and set up a fun-filled adventure kayaking or biking from brewery to brewery in downtown Traverse City. Leave the details to us. We take care of everything …. except the beer tasting; you’ll have to do that yourself. Traverse City is one of Michigan's most popular micro brew destinations! 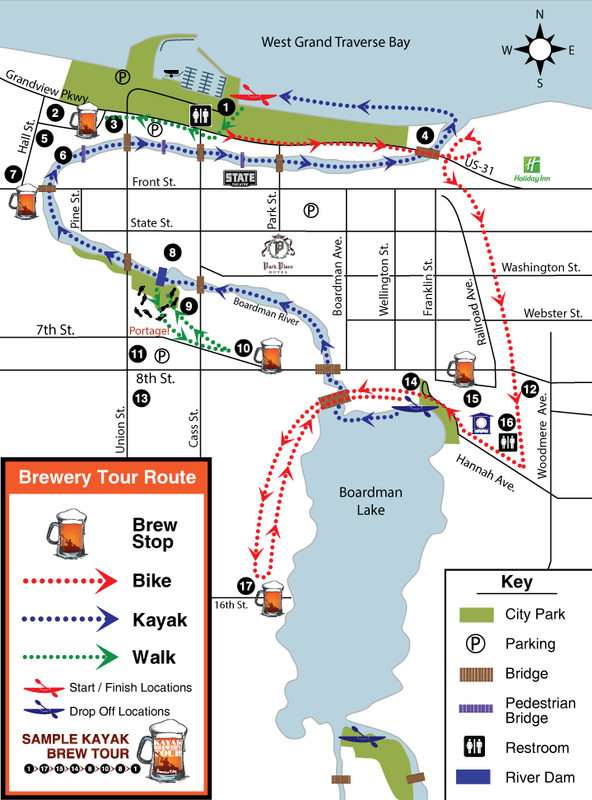 The best way to experience these unique breweries is with a guided tour offered by TC's very own Kayak Brewery Tours. Paddle TC, our sister company, located at Clinch Park on the shores of West Grand Traverse Bay offers a wide variety of tours. The tours are as varied as your imagination. Northern Michigan becomes your playground. Paddle TC has Kayaks, Stand-Up Paddleboards and Bikes for your touring pleasure. And, like the brewery tours, Paddle TC takes care of the details so you can concentrate on the fun. For your adventurous spirit Paddle TC offers the following rental items: Jackson Riviera Kayaks, Starboard Stand-Up Paddleboards, Bounce Stand-Up Paddleboards, and Electra Bikes. Kayaking + Brewery Tours = KaBrew. Take a kayak trip along the Boardman River in Traverse City and stop along the way at some of the best craft breweries in Northern Michigan and you have what is called a KaBrew! Join us on a KaBrew adventure any day of the week during our scheduled times (11:00 am - 3:00 pm and 3:30 pm - 7:30 pm). Oddly enough, your Brewery Tour adventure will start on a bike. Pedal to the Right Brain Brewery to enjoy your first pint. Head to the Filling Station for your next round. After The Filling station you will continue on your bike to Hull Park where your kayak will be awaiting you. 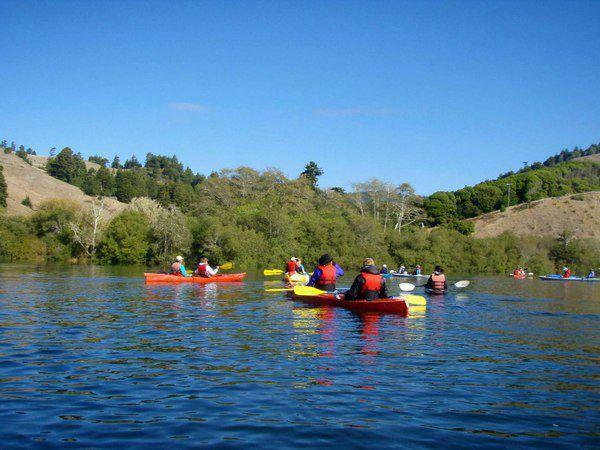 Launch the kayak and float down the Boardman River to either the Rare Bird or the Parlor. Jump back in the kayak to paddle back to Clinch Park. The off to The Workshop we walk to conclude our tour! Our Local Breweries include: Right Brain Brewery, The Filling Station, Rare Bird, The Parlor, The Workshop, Brewery Ferment, Tap Root Cider House, Mackinaw Brewing Company, and North Peak Brewing Company. KBT is a Traverse City based company that specializes in fun. Well, it actually specializes in Traverse City Craft Brewery Tours type of fun. KBT takes care of all the logistics so you and your friends can enjoy the paddling, pedaling and pints. If you are looking for bike, kayak or standup paddleboard tours around Northern Michigan without the brewery hookup, than our sister company, Paddle TC can assist you. Paddle TC has knowledgeable staff and reliable equipment (all new for the 2016 season) to help you tour Traverse City.